Showed Aidan a Muesli bar wrapper as an example of the task. Displayed on his Chromebook pictures of fruit and wheat products. Aidan selected apples, bananas and Weetbix. The pictures were printed, cut out and glued onto a wrapper template. 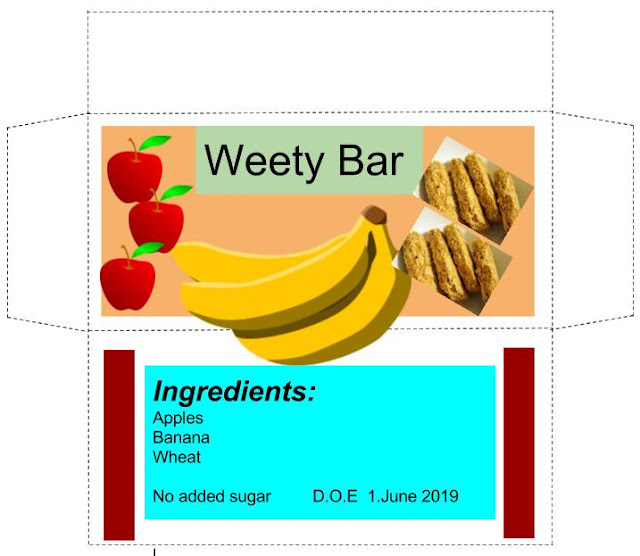 Aidan pointed to the picture of the Weetbix when asked about a name for his healthy bar - Weety Bar decided upon. The final healthy food bar wrapper was done on the Chromebook.